We’ve already had extensive damage from severe storms on the East Coast and across the Midwest. These storms caused power outages that lasted for days in the middle of a record-breaking heat wave and cancelled 4th of July celebrations. A big storm can knock your power out for days. And, you really don’t want to be shopping for supplies during or after the storm when everyone else is trying to buy the same emergency supply items. Most importantly, be prepared to live without the modern conveniences that we have all gotten used to. You won’t have small appliances to heat up frozen meals or electricity for news and entertainment. Evacuation isn’t just for hurricanes. You should arrange a place to stay in case you have to leave during the storm. Think of conditions that could make your home unsafe, like flooding, fallen power lines, or structural damage from wind and falling trees. You’ll need to stay someplace close so you can get to work and manage repairs. If your closest relative lives 200 miles away that won’t be much help, and the closest undamaged hotels will be booked quickly. Be prepared. It will make it easier for you to ride out the storm. Summer has ended and we are now into Fall. Do you know what that means? There are important preparations to make! Yes, of course, you need to rake, and bake, and make costumes, and shop for the holidays. But isn’t there something you’re forgetting? You need to prepare your home for winter weather! Those of us in Connecticut have seen unusual weather this year: earthquake, tornados, hurricane, not to mention feet of snow… and 2011 isn’t over. I hate to think how much snow we’ll get this year. Why? It may seem counterintuitive. How can paying for a tune-up save you money? For starters, it’s much more expensive to replace or repair a furnace. And, obstructions and dirty vents can reduce your energy savings. That’s not to mention the dangers of carbon-monoxide poisoning. Check to see if your utility offers a free annual checkup. Seal up any drafts from windows or doors. Why? Leaks cost you money, every day, every minute that your furnace is running. Our front door developed a crack in the wood that we repaired to seal up the draft. If you need to replace windows and doors, check to see what energy tax credits are available to you. How do you check for drafts? Here’s a fun trick: Have someone aim a hair dryer from outside while you hold a lighted candle inside – carefully! If the flame moves or goes out, you know you have a heat leak. Why? Learn from my failure. You don’t want to deal with a roof repair in winter. Trust me on this. Why? Chimney bricks are more exposed to the elements and quicker to crack than the bricks on your walls. They’re also difficult to repair in winter because the cement mixture that holds them together needs to dry. You don’t want to cope with water damage in February when it can be prevented with an inspection in October. Why? What do you see after every single snow storm? Photos of damaged property from fallen limbs and trees. Taking care of dead or weak branches can help protect your home. Let me know what you are planning on doing for your home. It’s summer – hurray! But with summer comes the possibility of storms and power outages. This has been a year of unpredictable weather. Are you prepared for whatever comes next? These are things we have to think about. Batteries: Needed for flashlights and/or lanterns, battery operated radio, etc. Water: If you have well water, have water stored in containers (both drinking and for washing). Your pump will not work without electricity. Non-perishable food: We all have some canned food, but could you make a meal with it? Do you have a manual can opener to use when the power is out? The difference between winter and summer storms is the outside temperature. With this being summer, you have to think about preserving and using the food in your refrigerator and freezer. Do you have grill supplies handy to grill the food if necessary? Do you own a cooler to store food if need be? If you hear of a possible storm coming, take precautionary steps before it strikes. Turn up the temperature in the fridge and freezer (food will last longer). Fill up the gas tank on your car (gas stations can’t pump gas without electricity). Get cash (if there are stores open they may not be able to accept credit cards). Get bottled water if needed and be prepared to live without life’s conveniences. The more you do to prepare, the better you will be able to weather the storm in your own home. Are you prepared to handle anything life throws at you? This can include anything from an immediate crisis to a major life hurdle. Take a good look at your life and think about some of the situations I am talking about, and think about what you would need to do in your life to be prepared. If you had to leave your home within a short amount of time (storm approaching, fire, flooding etc.) would you know what important papers to take with you? Could you gather all of them in 30 minutes or less? This should be a goal of yours, to have your papers organized and ready so you only have to grab one container (a hard drive, a file box, or a folder) – and go. In addition, what about those personal items that are irreplaceable? Could you grab those, too? What if the person who handles the finances passes away? Would anyone else know where all the financial records are? Do you know where all your assets are? Do you know what liabilities you are responsible for? In many families, one person handles everything. Both people should know what is going on – just in case. That’s especially true for the paperless households who do everything online. More than one person must be able to access all of the accounts because there won’t be a file cabinet to sort through. If you are prepared and organized ahead of time, it will make life much easier for you. Start to think about this today and make a plan that works for your situation. Being ready and knowing what you should do will save you so much time and effort if you find yourself in a bad situation. The first four months of this year have provided all sorts of weather challenges all over the country. We started the year off with record breaking snow storms, in April, there were major tornadoes (over 300 in one day), and now flooding. What is going on with this weather? Are you prepared for whatever weather disaster comes next? Read and find out! There is more to worry about than the actual storm. You could experience long term affects like power outages, flooding, wind damage, and more. Don’t assume that you won’t experience a weather disaster just because it has never happened in your area before. These tips will prepare you for any kind of disaster, so read on. Do you have proper insurance coverage? When was the last time you discussed your policies or updated them with your insurance company or agent? It could be well worth your time to do this in the next couple of weeks. While you’re there, you should also ask about umbrella coverage if you don’t have it already. As the name implies, this is a general purpose policy which provides additional protection above and beyond your existing policies. It is a relatively low cost insurance that can make a huge difference if you have to file a claim. Meeting Place: Have an agreed-upon meeting place. The quicker you can do a headcount, the quicker you can move to locate anyone who didn’t make it out. Have 2 meeting place locations. One right outside your home (sidewalk or driveway) and the other off your property (friend’s house, library, or school). Contact Person: Specify one person to be the call receiver. If your family gets separated, and cannot get to one of those locations, the separated parties should text or call the main contact. This will save confusion and missed calls. Make sure everyone knows the contact person’s phone number or has it stored in their cell phones! Have a full tank of gas. Gas stations can’t pump gas if the power is out. Stock your disaster supply kit. In a serious storm, this could be well worth the effort. Include drinking water (at least one gallon of drinking water per person per day), food (canned, dry and other non-perishables which don’t require cooking, water, or special preparation – don’t forget a manual can opener), prescriptions and medications (three day supply recommended), first aid kit, flashlights, battery-powered lanterns, and AM/FM radio plus extra batteries. Prepare a pet supplies bag. Don’t forget your pets! They’ll need food, water, medications, and leashes. This way you will be ready for whatever weather comes next. Is there something else that you do that I didn’t include? Tell me in the comments section. I have no idea what is going on with the weather around here. First, we start the year with a record number of snow storms and now the rain. What are we supposed to do? We need to be prepared for whatever weather comes our way. Start by talking with your insurance company and/or agent and discuss what your insurance covers and what it doesn’t. You should be doing this every couple of years. If you can’t remember the last time you did this, then it’s time. You may find that you need to add or increase certain coverage. You should also discuss flood insurance. It doesn’t cover everything and usually has a high deductible, but you might regret not having it. Next, do you have emergency supplies in your home? If you lose power, do you have lanterns (better than candles and not a fire hazard), battery operated items (radio, can opener ) barbeque grill for cooking, full tank of gas for your car (gas stations can’t pump gas without power), emergency cash on hand, etc. Do you know where these items are? I keep mine all together in one basket. If you had to evacuate your home in a short period of time, do you know what you would need to take with you? You should have your important papers and records in one easy-to-grab place so you can get out fast. Being prepared ahead of time makes it easier to ride out a storm in comfort or evacuate your home quickly. 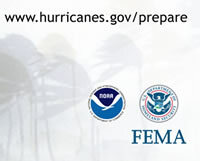 Hurricane Preparedness Week will be held from Sunday, May 23 to Saturday, May 29. We all know we should have flashlights with new batteries, manual can opener, candles etc but do you follow the advice? We had a bad storm this winter, a nor’easter, which can produce hurricane force winds Yes, I had all those on hand But I didn’t check them ahead of time My second flashlight didn’t work I didn’t have a cell phone charger for the car So off I went on Sunday morning to the store along with everyone else driving around, being detoured around fallen trees and power lines to find that one open store that still had what I needed. Car chargers for your electronics cell phone, PDA etc. Barbeque grill to cook on, or, know what restaurants are open we had a meal at the hospital restaurant since we knew they would be open when others restaurants weren’t or had a really long line to get in. Also, you need to know where you have kept each of these items so that you can find them when you need them. Before this happens to you, please check your insurance policy to make sure you have the right coverage for the proper amount Yes, this for homeowners as well as renters Renters insurance is a small amount to pay compared to losing your personal property that the landlord’s policy doesn’t cover Contact your insurance company today and be ready for the next storm.